user warning: Table 'drupalgastronomer.comments' doesn't exist query: SELECT COUNT(*) FROM comments c WHERE c.nid = 123 AND c.status = 0 in /home/dgabriner/gourmetgastronomer.com/modules/comment/comment.module on line 992.
user warning: Table 'drupalgastronomer.comments' doesn't exist query: SELECT c.cid as cid, c.pid, c.nid, c.subject, c.comment, c.format, c.timestamp, c.name, c.mail, c.homepage, u.uid, u.name AS registered_name, u.signature, u.picture, u.data, c.thread, c.status FROM comments c INNER JOIN users u ON c.uid = u.uid WHERE c.nid = 123 AND c.status = 0 ORDER BY c.thread DESC LIMIT 0, 50 in /home/dgabriner/gourmetgastronomer.com/modules/comment/comment.module on line 992. I recently moved to New York City. This means, among other things, that the budget has tightened up. I take my lunch to work, and of late it has been various variations on an old standard—hummus and pita. I had hummus and pita plain, with arugula, pita and sautéed broccoli rabe, pita, hummus, and roasted vegetables. My office sits two blocks from Union Square, the home of the best greenmarket in the city. Four times per week, farmers truck out in the freezing cold (this whole 17 degrees, feels like -4 takes some getting used to) to ply their wares. Unlike California, winter rather limits the options. It also makes things rather pricy. Hard squash can be had for about the same as at home, but greens, well that is a different story entirely. I almost choked on the sample of tofu at one stand not because it was frozen (which it was) but because beside it was a pile of rather anemic looking baby kale for $6 per quarter pound. Even those of us who count on our fingers can soon figure that $24 per pound does not a cheap salad make. Needless to say, my consumption of fresh-farmed lettuces has declined. But more on markets at a later date. Rather than spending the entire day slaving, I went to see the Marlene Dumas exhibit at the New York MoMA. Upon returning and finding myself with little time or will to think up something fancy this particular Sunday, I thought I would keep the chickpea theme, albeit in a new variation. 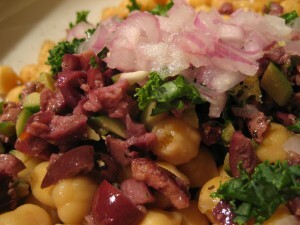 I often read the blog chezpim, and in the most recent posting she mentioned a recipe from Deb of Smitten kitchen. 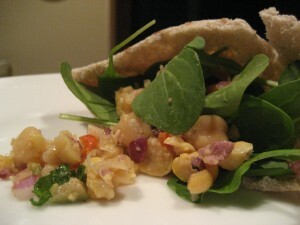 I went visiting and found Deb’s recipe for smashed chickpea salad. I decided to adapt it a bit and give it go. The recipe takes no time at all, and makes for a good lunch. I soaked the shallot a bit to take some of the bite, and the aftertaste, out. It’s just good office manners. Chickpea Pita Adapted from Deb of Smitten Kitchen For salad: 1 can of chickpeas (Trader Joes makes pretty decent ones) 4 tiny red sweet peppers (the kind that I’ve blanked on the name of that you find at the olive bar in nice supermarkets, or in renovated Safeways) One lemon (use organic if zesting) 5 kalamata olives, pitted an chopped 5 fresh green olives (castelvetrano or others) pitted and chopped 1 handful flat leaf parsley, roughly chopped ½ shallot, minced ¼ cup vinegar, white, red, or sherry. Salt Sugar Pepper 2 tbs olive oil, or more to taste For sandwich: Pita (or two slices of another bread) Arugula Mince the shallot, and then drop into the vinegar. Add a bit of salt and a tiny bit of sugar, if desired. Let the blend macerate while you continue with the rest of the ingredients. Open the can and drain the chickpeas, then rinse. Olive oil tastes much better than canned chickpea juice, and the salt content can be adjusted more easily if the beans have been well rinsed. Let drain, and then put into the bowl to compile the salad. Chop the olives by cutting around the pit, then chopping the slices smaller. Olives that have not been pre-pitted chop better and generally have better texture. Chop the peppers similarly. 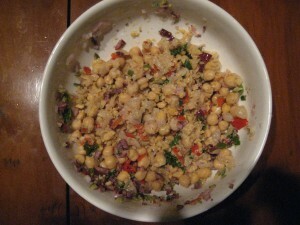 Put chopped olives and peppers in with chickpeas. Zest the lemon as much as desired (I used rounded teaspoon or so), then cut it and squeeze about a half a lemon worth of juice into the bowl. Add the zest. Reserve the other half for after tasting in case you want more acid, or for another use. Chop the parsley, then add that too, along with the drained shallot. Add two tablespoons of olive oil, salt, and fresh ground pepper, though not too much. Mix the ingredients, then take a fork or your favorite mashing tool and crush some of the beans to form a little bit of a paste—just enough to make it stick together a bit. Taste, and adjust seasonings. Then get out your favorite bread of the moment—I’ve been into pita, because I can stuff it and not worry too much about the fall-apart factor. Add a little tahini if you have it, or a touch of olive oil, then put in arugula and stuff the rest with the chickpea mix. Feel free to add other sauces (Aioli? Tapenade? Harissa!) if you like. Eat, at home or abroad.